I am so excited to talk about more ceremony decor! As I mentioned in my previous post about the ceremony, the details of your ceremony decor will transform any area into exactly what you envision. When you are looking at Ceremony locations, picture in your head how you want everything to look, what do you want to see (besides your almost hubby standing at the end of the aisle), what do you want your guests first impression to be? Will there be chairs, pews, bales of hay? Will there be anything on the end of each row? An aisle runner under your heels? All of these pieces tie together to give you the perfect first glimpse of how this amazing wedding is going to be. First think about the end of each row, there are so many options for this based on theme. Each theme gives a new idea, and a new way to transform the space. Ribbons- This has such an open and fun type of feeling, it can also be customized in so many ways. You can also use lace, burlap, or twine for this same type of decoration, but a totally different look. Lanterns- If you are having an evening wedding lanterns can light up the aisle for guests, and illuminate the bride as she walks down the aisle. What a perfect way to set the tone for the evening. The lanterns can also be easily be used during the reception as centerpieces or decorations. Mason Jars- These tend to be more rustic in a normal setting, but this year there have been a large variety of ways to use Mason Jars. They can be rustic, romantic, nautical, and classic, depending on the use. This trend can also be enhanced by adding it to another piece of decor. Flowers- The options are endless with flowers; however, this is most likely the most expensive options. If you are trying to have a bouquet of flowers on each row, you may decided to skip every few and use something else on the other chairs. They sure do look beautiful though! Candles- If you are going for a classic and romantic but simple look, candles are perfect. By having them at different heights, you are able to draw attention, but guests will still focus on the other details as well. It is so fun to add a mixture of a few of these and create a unique look. Now, we can talk chairs. I normally suggest decorating the last row of chairs. This is another way to set the mood for your wedding, and it adds a little something to the photographs. Tulle- The best thing about using tulle is the price. If you are trying to be Budget Savvy, tulle is a great way to transform a chair since you can get it in any color and use it in several ways. The cleanup is also really easy! Chair Covers- Using chair covers is perfectly fine, and it can be done in many different ways. You can alternate colors, tie a different colored sash around them, or even use different shades for an ombre effect like the picture above. The possibilities are there, you might just need to be a bit more creative. 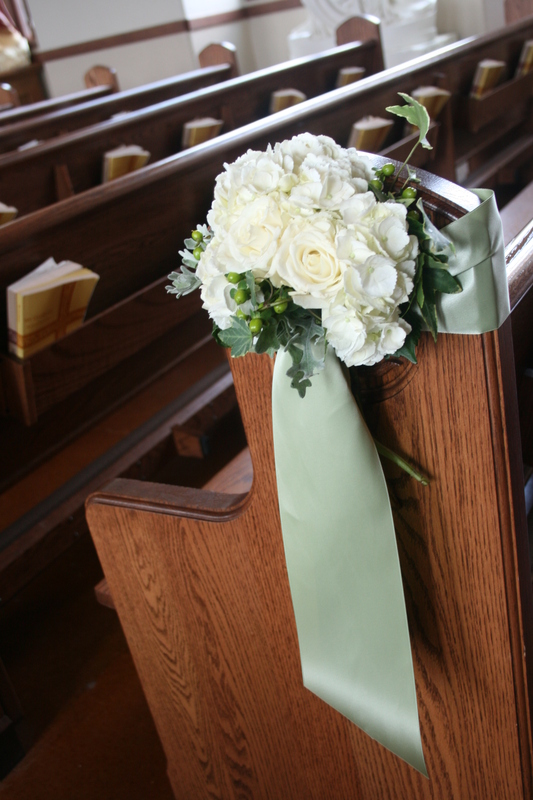 Ribbon- If you are using ribbon on your aisle chairs, you might as well use them on every guest chair. Customize it how you like, use a few or line the entire chair, it is all up to you and your theme. Hay bales- If you use hay bales instead of regular chairs you can add different covers to change the look. You may chose to go bright and bold, or stick with a natural palette. As you can see, there are so many ways to customize your ceremony. I can’t wait to share all of the details from my own ceremony with all of you in June! What are you planning to use to decorate your ceremony? Macy is an Event Manager turned Lifestyle, Wedding and Travel blogger who got married in 2015. You can read her wedding planning posts here.